Delinquent poodle wins £15 for World Land Trust (WLT) Mahvro, a rescue poodle, owned by Lyn Griffin who lives in Redditch, won first prize in the ‘Humour’ category in a recent competition at the Fladbury Walkabout, in the Vale of Evesham. 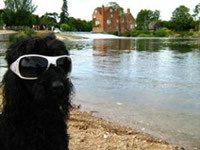 “We were down by the river and I put my daughter's sunglasses on Mahvro for a joke, thinking he'd shake them off but he seemed to like posing in them. He is a rather a sophisticated looking dog and photographed against the picturesque rural setting struck me as comical which is why I entered him in the ‘Humour’ category’. Mahvro is a seven-year-old delinquent poodle which Ms Griffin ‘rescued’ three years ago from previous owners who could not cope with his antics. Ms Griffin, a WLT partner, and donor for many years, has asked Mahvro to donate his prize money to WLT. You can join Ms Griffin and help WLT support its most urgent projects, by making a regular donation and becoming a WLT partner.